Curiosity may have killed the cat but it doesn’t even come close to slowing down a toddler! Parents will know this all too well – children ask about a bazillion and a half questions every day, and “why” is one of the main culprits. So this month’s blog is focussed on the big question: why? For what cause, reason, or purpose? But of course, we’ll apply a plumbing angle to our theme! “Why” questions are often entered into Google when looking for quick answers to an astounding range of life’s puzzling perplexities. Why is the sky blue? Why is this rash not going away? Why is the grumpy cat so popular? Some of these are harder to answer than others, but the Bear Team has put their collective heads together and come up with the most common “why” questions they’ve encountered in the plumbing trade. Toilets can make all sorts of noises, and being such a vital and taken-for-granted part of your home, it’s important to know what’s what. If your toilet has suddenly become fluent in Parseltongue and is hissing like a snake, this is usually an indication that water is leaking from the cistern into the bowl. This is wasting water which will add to your water bill, so call us to check it out! Don’t ignore a gurgling toilet. The gurgling sound can occur when air escapes backwards up through the toilet, and generally means that there’s a blockage either in the sewer line, toilet or vent stack. There are a couple of possibilities here, both best to check in a white basin or a white bath. Start by turning on the hot water to see if the water is brown. Then turn off the hot tap and turn on the cold tap. You could have rust or sediment build up in your pipes, which could come from old galvanised pipes in your house or if the city’s main water pipes are having maintenance carried out on them. If you’re only noticing the brown water when your hot tap is running, this is a sign that your hot water heater is starting to rust and will need to be replaced. Hot water units tend to have a life span of between 8 and 10 years, so if your system is getting close to that vintage, it might be time to have a chat to us about your options. When you have water backing up in your sink, it’s usually becuase it can’t drain through the pipes because there’s a blockage somewhere. This is one of those instances where prevention is better than the cure. Kitchens are the soul of most homes, with an extraordinary amount of daily activity. It’s important to keep “stuff” out of your kitchen sink – and by that we mean cooking oils, fats and grease, vegetable peels, coffee grounds, fruit rind, food scraps, etc, etc! Anything that can congeal, harden or block your pipes should be put in the bin instead. A drainer for your sink is also a cheap and easy way to keep the “stuff” from going down the drain. The bathroom can be a place of many different smells, but have you ever noticed a bad smell from your floor waste? These are designed to hold water to keep smells out. Here’s a tip: Pour a bucket of water down all floor wastes to refill or top up the water level. For other bad smells, there’s always air freshener! If you’ve got low water pressure in your shower, check the shower head first. Those small holes in your shower head can become clogged with mineral deposits, making it spray unevenly. Here’s a simple tip – place a bag with warm vinegar around your shower head and secure with a bag tie and soak it for about an hour. If any deposits remain, use an old toothbrush and scrub gently. Then rinse and re-attach the shower head. Voila! Poor water pressure is often due to clogged pipes and can also be due to reduced pressure from the water main due to leakage, equipment failures or blocked service pipes but also be aware most new tapware will be fitted with a water restrictor, so if you fit new taps you may find the pressure lower than what the old taps may have provided. See – some “why” questions are easier to answer than others. In any of these cases, give the Bear Team a call. If it’s plumbing related, we’re sure to have an answer for you. 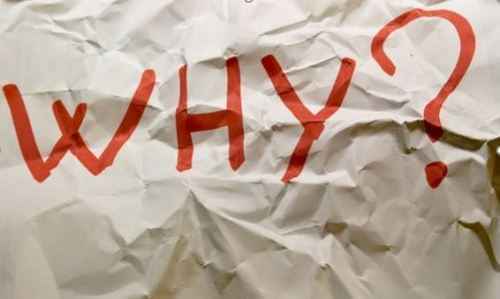 And if you’ve got a “why” plumbing question, why not email it to us at office@bearplumbing.com.au and look out for the answers on our Facebook page.